StandardVision has announced that it has been awarded the advertising sales contract for CIRCA’s exterior street facing displays, which are set to be the largest in California. The project is being developed by Jamison Properties and Hankey Investment Company. As StandardVision partners with advertisers, over 24,000 square feet of advertising space will revolutionize perceptions of digital and architectural branding synergies on some of the most trafficked streets in Downtown Los Angeles (DTLA). It is estimated that DTLA welcomes over 10 million visitors per year, while its resident population is ever-growing. Advertisements will go live in the first quarter of 2018, and with over 14 million monthly audited impressions, this will mark the launch of advertising campaigns that have maximum visibility in an affluent and trend-setting demographic. CIRCA will have over 18,000 Square feet of digital displays on Figueroa & 12th Street and approximately 6,100 square feet of static display on Flower & 12th Street and will include state-of-the-art LED technology by Sansi North America (SNA) Displays. 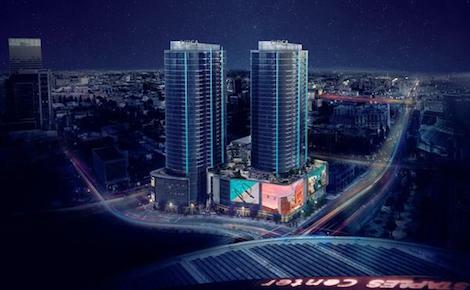 CIRCA, located in the South Park District at 1200 S. Figueroa St., will include two 35-story residential towers, an amenities deck, a nine-story parking structure and 48,000 square feet of nationally-branded retailers and restaurants. The prime ground-level retail space will cater to CIRCA residents, Los Angeles locals and millions of travelers to the historic Los Angeles area and is the most recent example of DTLA’s economic and cultural renaissance, which over the past decade has transformed the area into a vibrant live, work and play destination. In addition to the development’s direct exposure to consumers in DTLA, CIRCA’s advertisements will benefit from secondary impressions from venues located across the street, including the Staples Center (4+ million yearly visitors), the Los Angeles Convention Center (2+ million yearly visitors) and LA Live (5+ million yearly visitors). This entry was posted on Thursday, January 4th, 2018 at 09:36 @441 and is filed under DailyDOOH Update. You can follow any responses to this entry through the RSS 2.0 feed. You can leave a response, or trackback from your own site.